September has been much slower for new car sales than anyone thought (including me), so the expected flood of part-exchanges has been more like a gentle flow. The trouble is, everyone banked on buying September part-exchanges and, even though there are now too many buyers for too few cars, they still end up having to buy. So it isn’t a matter of buying under trade book, it’s more one of limiting the damage over book. Even policy unwarranted mileage part exchanges were making over book. Like the 32,400 mile 2000V met green SEAT Ibiza 1.4S 5-door, sold for £3,725; the 8,760 mile 2000W Chagal blue VW Lupo 1.4S, sold for £5,150; the 5,903 mile 02 reg VW Golf 1.6S with a/c, sold for £9,500; the 34,000 mile 98S met red Mitsubishi Space Wagon, sold for £6,000; the 41,000 mile 98S (four year old) met blue Ford Focus 1.8 Zetec with Climate Pack sold for £5,475; the 92,000 mile 98R met red Mitsubishi Galant 2.5V6 estate sold for £3,950. 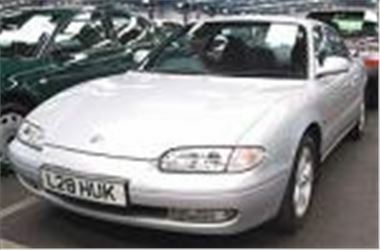 Even, wait for it, a 36,000 mile 97P solid green Daewoo Espero which started hopefully at £500 sold for £1,175. No, it you wanted cheap you had to be prepared to go for something a bit weird. They wouldn’t let a silver 47,000 mile 2000W KIA Clarus 2.0 Exec auto go for a silly £2,600. But someone drove home in a sensible, practical dark blue 66,000 mile 96P Mitsubishi Space Runner for £2,750; a silver 60,000 mile 87E Daimler Double Six SIII set one punter back £2,050; and the silver 50,000 mile 94L Mazda MX6 2.5 V6 auto in the photo for £2,900 was definitely lots of flash for not much cash. For information of upcoming BCA auctions, visit www.bca-auctions.co.uk Full list of auction centres throughout the country at www.honestjohn.co.uk (go back to the home-page and click on auction directory). Once again, Brightwells Auctioneers of Leominster, Herefordshire, will be holding the country’s biggest 4x4 Sale, next Tuesday 24th September. Full details will be on the auctioneers website, www.brightwells.com, closer to the sale date, or phone 01568 611325. Sales are held at Leominster Market, A49 Leominster By-Pass, Herefordshire every second Tuesday at 11.00am.